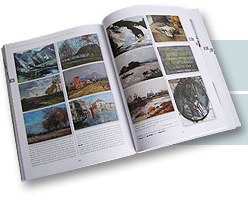 The dictionary of the Liège school of landscape painters (1880-1950) is in two sections: There is first a chronological list, followed by the much longer alphabetical classification. Further editions may well follow. For that reason, I appeal to all artists, art dealers, historians, art critics, enthusiasts (whether enlightened or not), relatives, friends, anybody close to an artist (forgotten or not). If you happen to know a date, an anecdote, or have any information about an artist, please do not hesitate to write me about it. If you own a work not illustrated here, please let me know. I apologise for any errors that may have escaped me. Please bring them to my attention. Constructive comments are welcome and will be taken into account. The dictionary can but benefit from widespread contributions. The dictionary of the Liège school of landscape painters (1880-1950) should be of value to researchers, collectors, all lovers of our terroir and to anybody simply interested. The desire to produce a useful tool was an important motivation. Time, patience and devoted support staff helped make publication possible. I hope you will find this dictionary of use and enjoy consulting it!